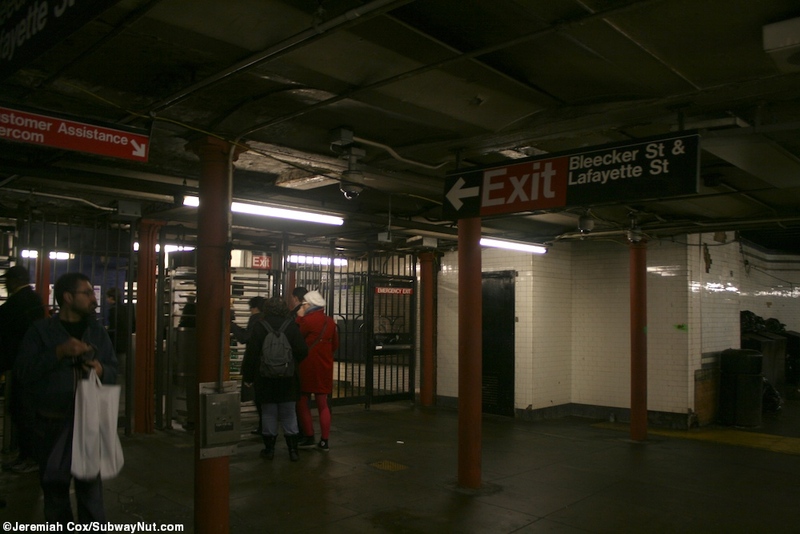 The Bleecker Street station has one of the strangest platform layouts that means a there is a free transfer to the IND 6 Avenue B,M,F,M station at Broadway-Lafayette Streets. 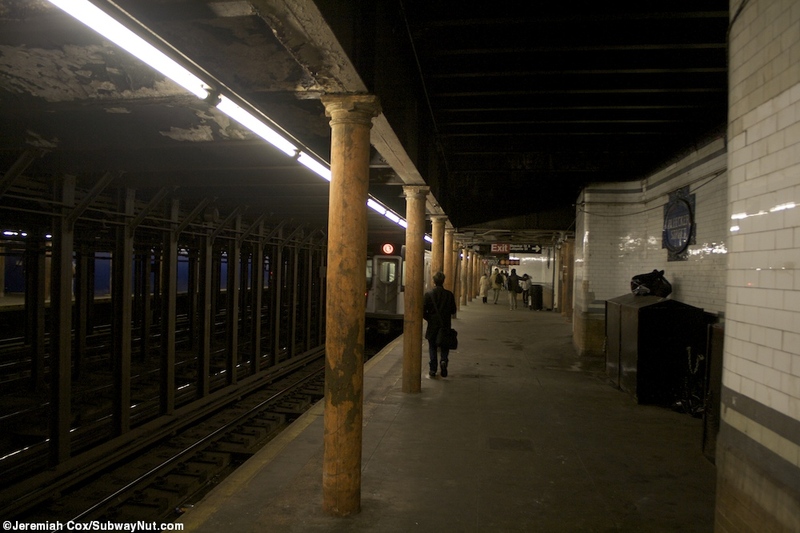 This has been the case since the 1950s itis one of the original stations of the IRT. 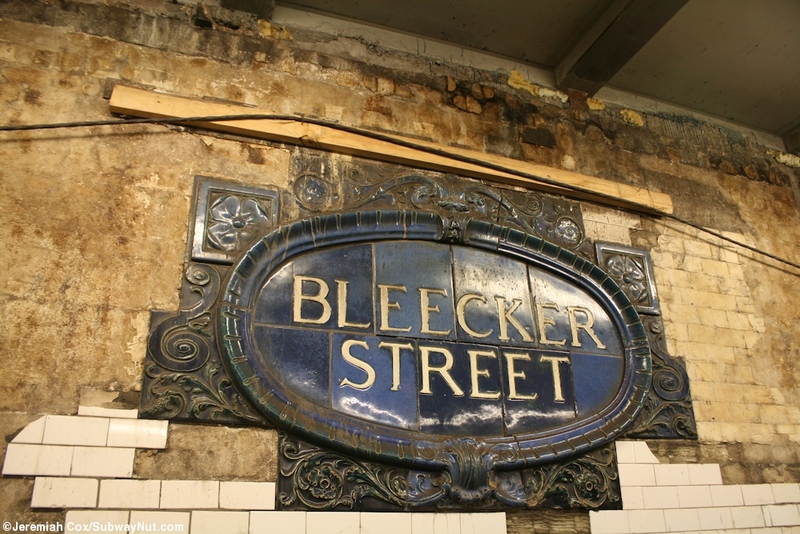 The stop's original portions have large blue raised terra-cotta faience name tablets (just two on each platform) that say Bleecker Street. 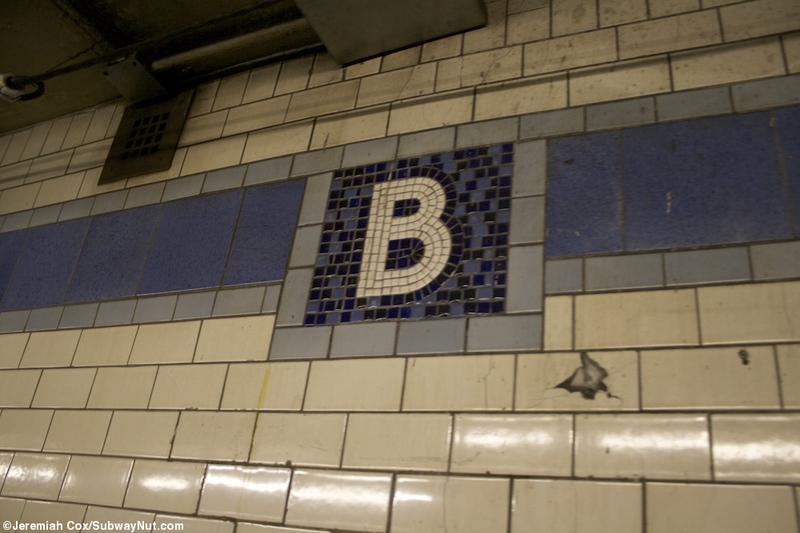 There are also little blue cornucopia Bs that form the stations trimline. 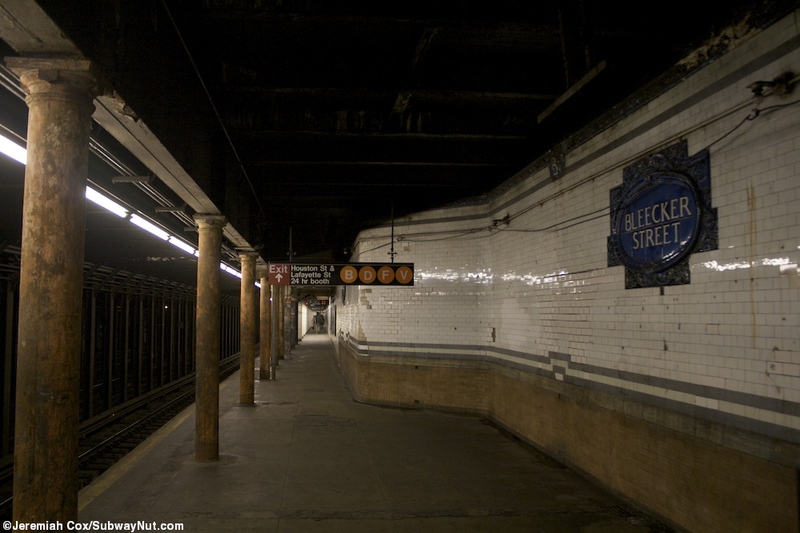 The uptown platforms only entrance is at its southern end (completely offset to the north from the downtown platform, a tiling and all identical to Spring Spree) where three street stairs, one is on the northside of Bleecker Street where Mulberry Street ends (maybe ten feet from Lafayette Street), and the SE corner of Bleecker Street and Mulberry Street. 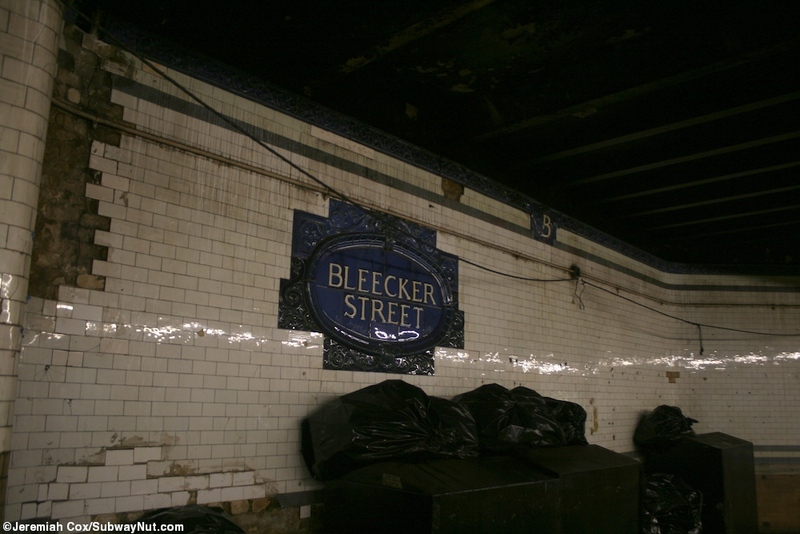 The third is at the SW corner of Beecker Street and Mulberry Street (almost southeast with Lafayette Street), these lead to a bank of turnstiles with a staffed token booth.The northern extension portion of the uptown platform has the simple blocky blue-green wall tiles with a line that says Bleecker Street in simple enamel, will be abandoned (probably turned into a storage room or something like that) once that platform is extended southward to connect to a new transfer to the Broadway-Lafayette Station that the downtown platform has had for years. 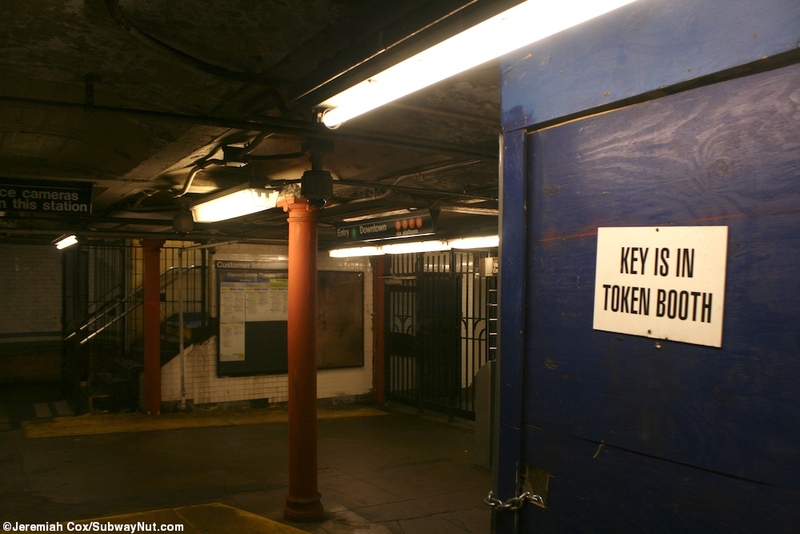 The original entrance at the now northern end of the downtown platform consists of two High Entrance Turnstiles that replaced iron maidens (former High Entrance Gates that only accepted tokens and jammed often) in May 1998. 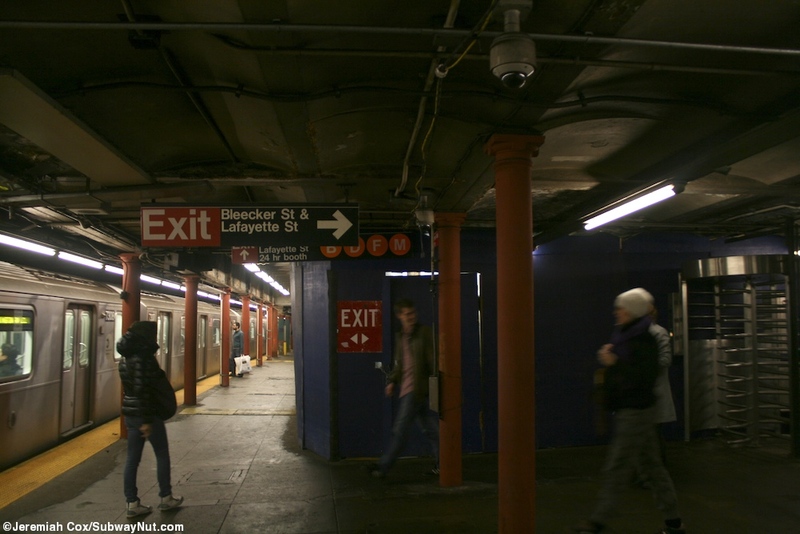 Meaning the entrance has been unstaffed for a long time, not just a consequence of the MTA's recent budget cuts basically removing station agents from all entrances except for one. 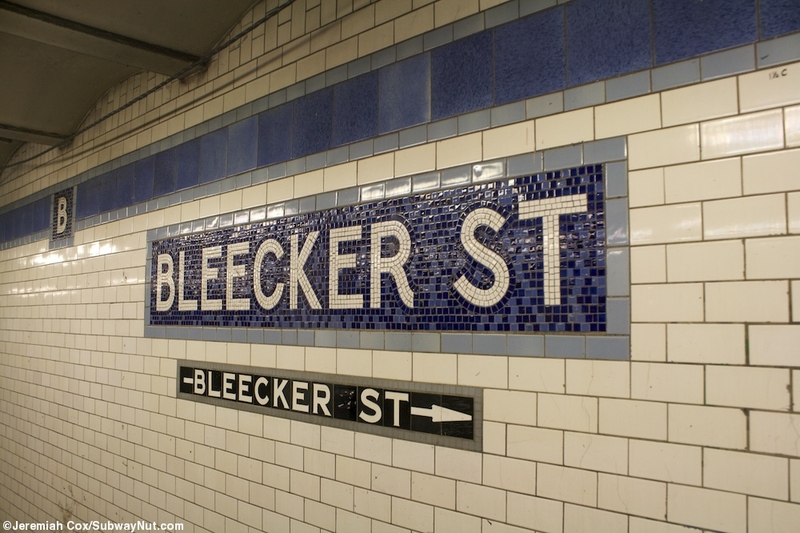 [NYT Article] This small entrance has two street stairs to the west side of Bleecker Street. 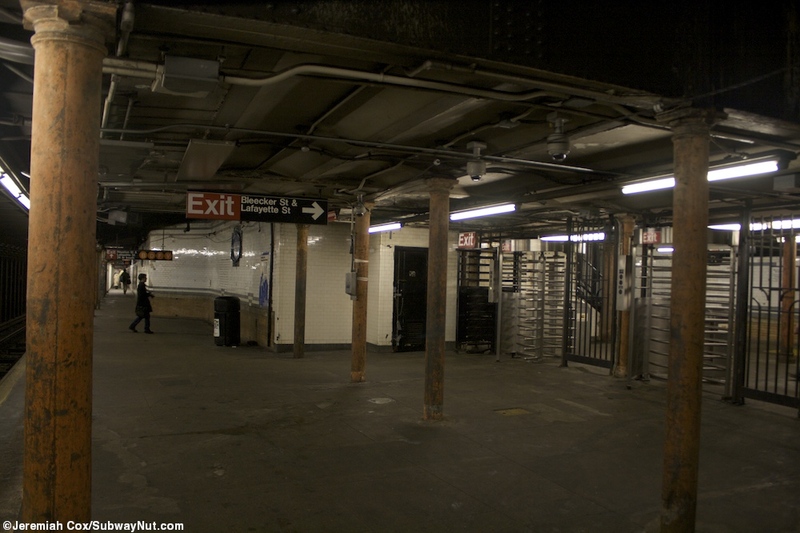 As of January 2011 one street stair had been replaced by the modern standard, one still was of a nondescript 1950s maybe vintage. 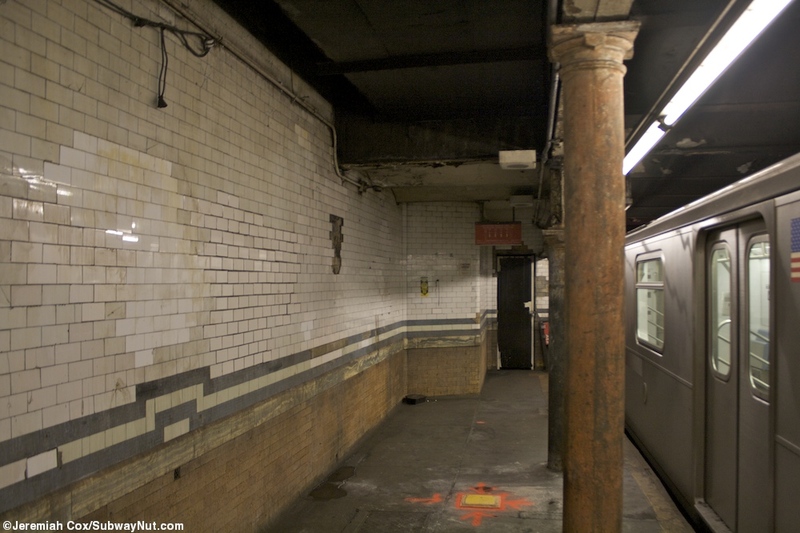 The downtown platform 1950s extension to the south for the downtown platform has simple white tilied walls with a blue trimline with Bs in it at regular intervals. 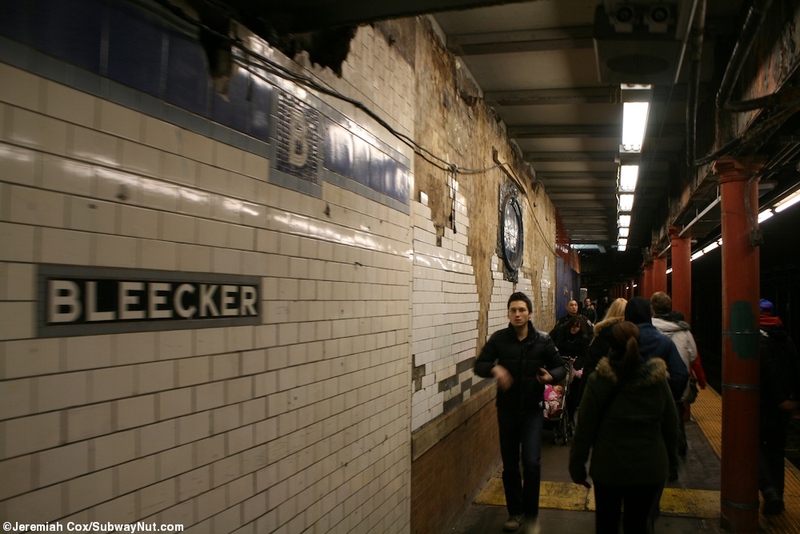 About midway up the walls are single Bleecker tiles. 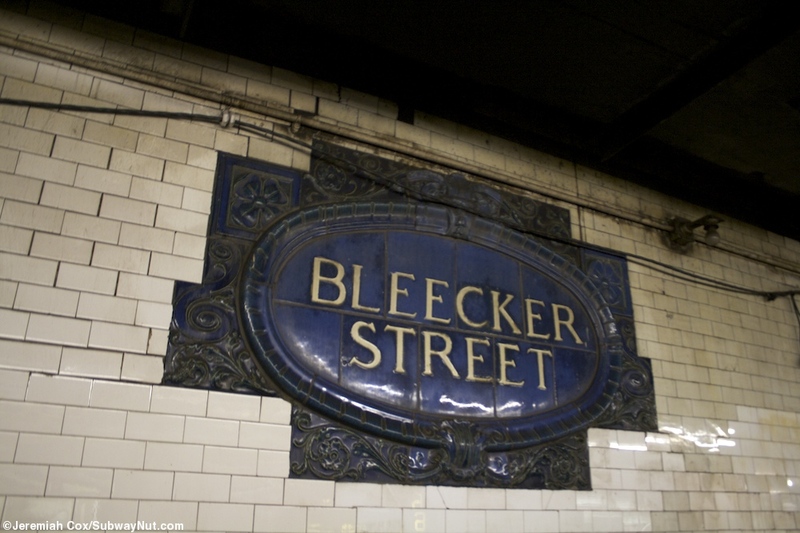 The name tablets have white text on a dark blue background with a light blue trim. 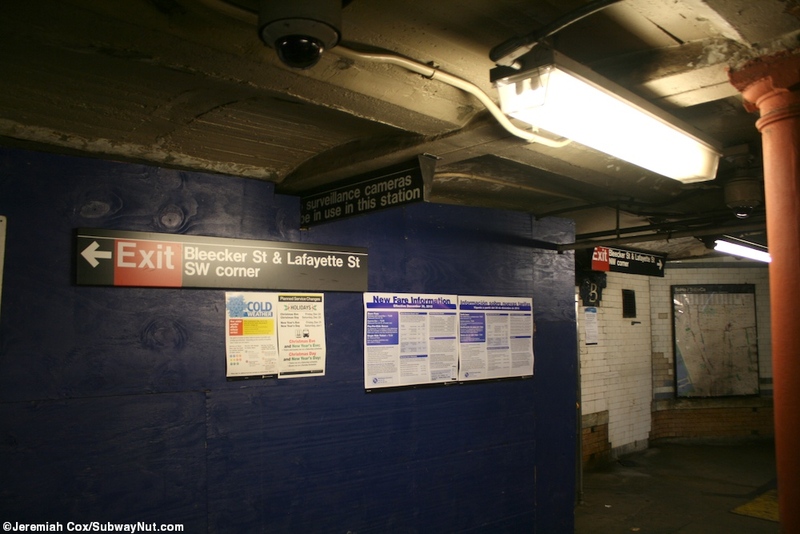 Renovations have currently made the downtown platform more narrow with a blue temporary plywood wall along most of it. 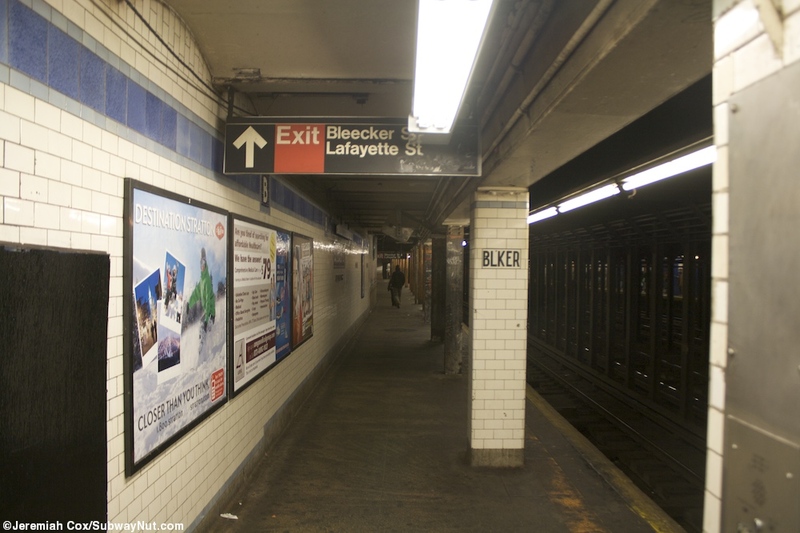 The downtown platform ends at its southern end with the connection directly to the upper mezzanine of Broadway-Lafayette Street and free transfer to the 6 Avenue subway only accessible from downtown platforms. 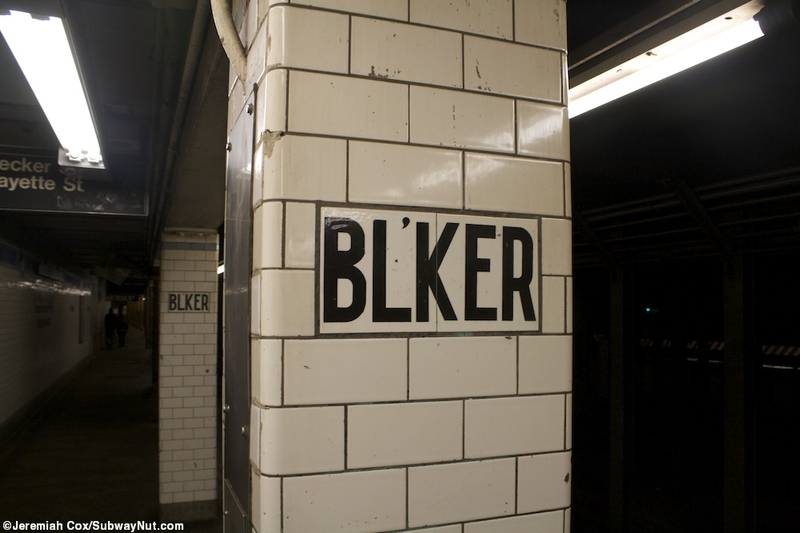 Its a very short walk.